A monstrous Creature suited for a Cull? We are back to strictly nocturnal animals, creatures of the night, which Willow the Vampire might encounter on her nightly ramblings through rural Stinkforthshire. Another member of the mustalid family, the badger, is a natural follow-on from my last blog post, since Badger is, of course, a heroic creature in Kenneth Grahame’s Wind in the Willows, my favourite English language book. The usual governmental idiots, who are quick to rush through new legislation, but much slower on the uptake of facts, tell us – without any evidence to prove their assertions – that badgers are harmful to cattle because badgers have nothing better to do than lurk outside a farm, sneak into cowsheds and fields the moment the farmer’s back is turned and pass on bovine TB to cows. Could perhaps bad livestock husbandry on the side of the farmer be blamed for cows contracting the illness? No matter how many vets sign petitions and state categorically that badgers are not to blame, the monstrous creatures that are politicians threaten a mass cull of badgers in the UK to take place this autumn. When one complains to an MP, all one gets back in response is a letter with nonsense from the Ministry of Fools, which typically doesn’t know which day of the week it is, let alone know anything about animals or care about their welfare. Given the EC subsidies rammed down the pockets of farmers when they lose livestock, one would have thought they’d be quite content with a badger conspiracy to wipe out cows. They have in fact, made around £1 billion in compensation in a decade – so one could allege it has been in farmers’ interest to manufacture evidence against badgers! Badgers spend most of the day underground, where they live in setts or burrows. Their diet consists mostly of small animals, fruit, roots and earthworms. They have excellent sense of smell, can dig well with their powerful fore-paws and claws and have powerful jaws with which to crush and munch their food. 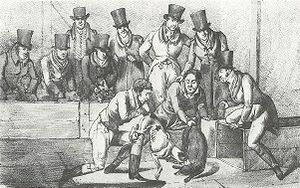 Badgers are also known for being courageous and ferocious fighters, which brings us to the other monstrous creature that should most definitely be culled: the disgusting people who delight in badger baiting with dogs, despite the fact that this has been against the law since 1835. Every year, many setts are wiped out, dogs are killed and badgers horribly maimed and tortured before they finally die a miserable, painful death. Convictions of such people are few and far between and even when they do get caught and convicted, the punishment reflects in no way the suffering they caused to dogs and badgers. Put such cowardly men in a pen with a few hungry vampires and see how they’d like it to be ripped apart! All badgers have a small head, which is typical of the mustalid family, and a squat, stocky body with short legs. Their outer fur is rather coarse and their heads are market with black and white stripes that are meant to protect them at night, when they come out to forage. 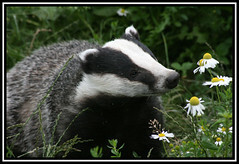 Far from being grumpy and unsociable as portrayed by Kenneth Grahame, badgers are sociable and playful animals. Adults and their young come out at dusk to play at the entrance of their sett, which makes dusk the perfect time to go badger watching with kids. These rather large mustalids can live up to 12 years and their habitats stretch from Europe to China and Japan. 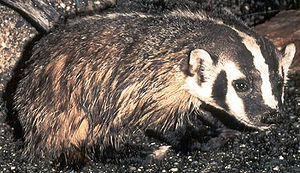 The Eurasian badger has a short, stubbly tail, but the Chinese ferret badger sports a long, bushy tail. The American badger has unaccountably large ears at the front of their head, while the other members of the badger family have far smaller ears that are set back from the forehead. The American badger is typically a solitary creature of the night, less inclined to fight, since it can dig itself a tunnel with lightning speed and vanish underground. The Hog badger distinguishes itself by an elongated snout that has pig-like nostrils. In its habitat in North East India, China and South East Asia the Hog badger is sometimes killed by leopards and tigers, but it doesn’t go quietly and puts up quite a struggle, making them perhaps not the most favourite of prey for said cats! The smallest, and probably cutest, member of the badger family is the climbing badger or Chinese ferret badger that comes out at night to forage for insects, frogs, fruit and small rodents. During the day it hides in rock crevices and underground burrows, but its long claws also allow it to climb trees and make a comfortable nest between branches. While Kenneth Grahame’s Badger helps his friends Mr Toad, Ratty and Mole to regain their self-confidence as well as Toad Hall, the wild badger living in forests and grasslands doesn’t make friends easily with other animals or humans, since it is rather shy. I’ve been fortunate to watch badgers in the wild on a number of occasions and have also seen badgers come into people’s gardens, when the homeowners left food out for the animals to find. It’s an amazing sight to see them snuffle up bread and fruit, chase each other playfully around the garden and have mock fights with each other (the badgers, not the homeowners, although on occasion…). Willow the Vampire and her family wouldn’t think twice about culling people who treated animals like the badger with cruelty and prejudice. Perhaps we should think of culling monstrous politicians at the next ballot box…unless any of you know a few vampires who can do it for us before autumn 2012? As usual, an excellent piece. I honestly cannot understand the thought process behind the badger culling. A very misunderstood animal I am assuming. What is so utterly horrible is that culling badgers would only cut down bovine TB by 16% max and nothing is done at all to eradicate bovine TB – it’s just one of those typical kneejerk reactions the UK’s government (irrespective of party involved) is to good at. In a couple of years’ time the whole process might have to repeated, killing hundreds of thousands of badgers needlessly without making a blind bit of difference to the lives of cattle. When I wrote to my MP my letter was passed on straight to the monsterous creatures who are proposing this – instead of my MP actually doing something about the concerns of his voters. So much for democracy in the UK!